In early 1986, about a year before his death, Serge Lifar, who had taken up residence in Lausanne, bequeathed a sizeable collection of documents, posters, news clippings, and articles for dance and arts periodicals. At an official event on 26 February, Serge Lifar donated to his adoptive city 38 crates, 32 cardboard boxes and 112 paintings that he had done during his stay in Cannes from 1970 to 1975, as well as a suitcase full of documents—a total of 7 cubic meters of material. In the words of the archivist Gilbert Coutaz: “These archives are extremely important to understand the personality of the choreographer prior to 1950, for they come for the most part from a period when media and film documentation were not very common. For Lifar, it is a challenge to oblivion, a proof of existence and way of giving recognition to a life that was passionately, proudly and energetically devoted to the dance”. In the 1950s, Serge Lifar fell in love with Countess Lillan Ahlefeldt-Laurvig. They lived together for thirty years in Cannes and then in Switzerland starting in 1981, at Glion, above Montreux, and in Lausanne, where he was awarded the City’s Gold Medal in 1985. He had often paid visits to his friend Coco Chanel in Lausanne. The “Queen of Fashion” had never missed any of his premieres in Paris. Later, she invited him regularly to La Pausa, her estate at Roquebrune-Cap-Martin and to her house at the Signal de Sauvebelin, in the hills above Lausanne. Coco Chanel passed away at the Ritz in Paris and arranged to have herself buried in Lausanne. Serge Lifar did the opposite: he passed away in a palace in Lausanne and had himself buried in Paris. Ill with cancer, he died in Lausanne on 15 December 1986. His last gaze fell on a group of swans on the lake, flapping their wings in a last ballet. 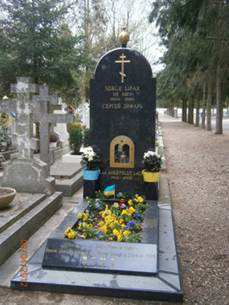 In his testament, Serge Lifar expressed the wish to be lain to rest in the Orthodox cemetery of Sainte-Geneviève-des-Bois, on the outskirts of Paris. This was carried out on 19 December 1986 after a moving ceremony at the Cathedral of Saint Alexander Nevsky in Paris. The corps of dance pupils, each carrying a white lily, formed a cordon of honour and the funeral procession halted in front of the Paris Opera to listen to the celestial chants of a Russian choir.